Recently, I received a message from Dr. Terry Swanson regarding Seven Mile Canyon near Moab, Utah. 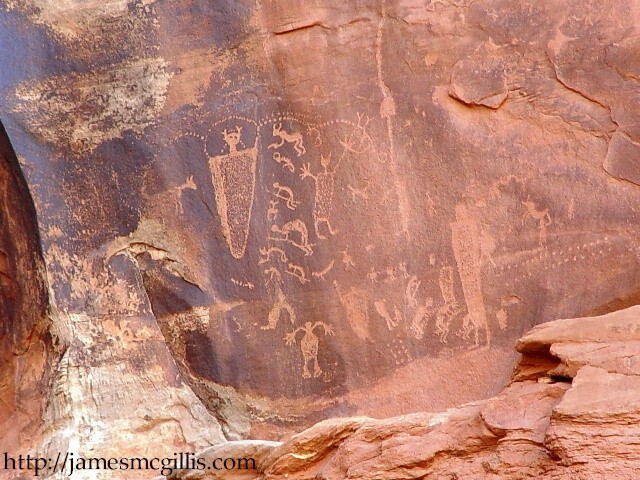 In part, it said, “Hello: I was trying to find info on the “Snake in the Mouth Pictograph” and came across your blog regarding Seven Mile Canyon and your trip there with Craig Childs. I am a retired Boeing engineer and spend a few days each year in the Moab area and even more time in the San Rafael Swell, Cedar Mesa areas. 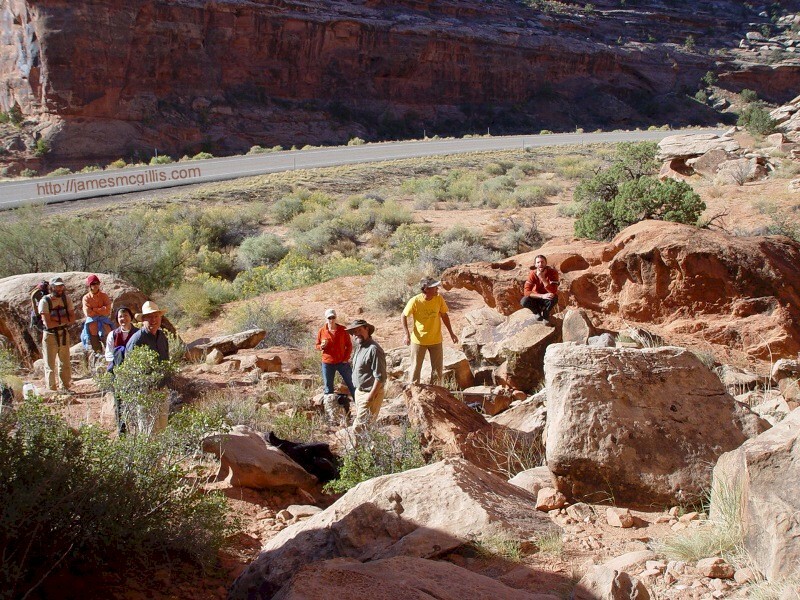 I have been to more than 400 rock art sites, belong to the Utah Rock Art Research Association (URARA) (meeting in Moab, October 2013) and the Arizona Archaeological Society, so I respect sites and never touch anything. It has been over four years since I last visited Seven Mile Canyon. I did make one attempted to visit there in April 2012, but the access points had changed and barriers prevented easy access. That day, I had insufficient time to park and hike Seven Mile Canyon on my own. With the new questions raised here by Terry Swanson, I hope to visit Seven Mile Canyon again in 2013. To answer Terry’s questions about our 2008 Seven Mile Canyon hike, I searched Google Maps for the Utah Highway 313 turnout where we had parked that day. I located it about two miles southeast of the U.S. Highway 191 junction, heading toward Canyonlands and Dead Horse Point. 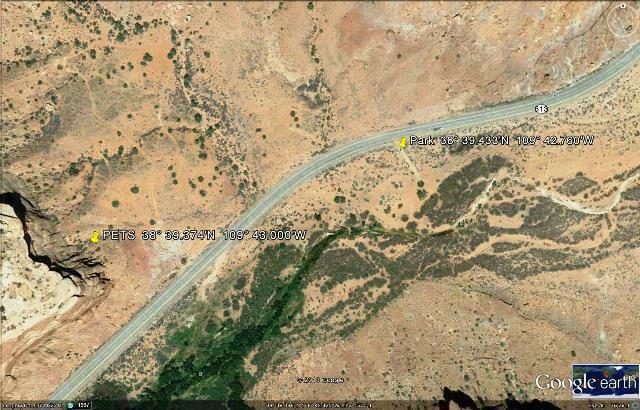 Prior to 2008, I knew of Utah Highway 313, but not about Seven-Mile Canyon. Not knowing where our driver was heading that morning, I was surprised when he stopped the van at a stub road on the east side of Highway 313. At that point, we were not more than twelve miles from Downtown Moab. Where we stopped, there were no signs or other markings. In order to find the place again, I photographed the Canyonlands Field Institute Van and our leader Craig Childs, with distinctive natural features in the background. If you search "Craig Childs" on Google, my close-up photo of Craig from that spot appears on the first row of the images results. That day, we visited two major sets of petroglyphs. The first set was just across the highway, in a small, boulder-strewn canyon. Around the lower edge of the canyon wall, we saw many casual markings on the rocks. It looked like ancient graffiti in a picnic area. Near the end of that brief sojourn, I hiked up on the rock pile and took a photograph looking down on our whole group. After crossing back over the highway, we followed a path through some tall, reedy plants. Growing as they did on the outside bend of the arroyo, even in October there was sufficient water beneath to leave mud on our boots. It was a tangled mess, with only a limited passageway back and forth between canyon and road. Later, much to our surprise, a couple of sales reps, out for a joyride in a Chevy drove past us in the arroyo. Somehow, they had driven through the wet and reedy area, not caring about the finish on their company SUV. From there, the two men drove up the sandy wash that comprises much of Seven Mile Canyon. As I learned in 2012, vehicular access from Highway 313 to Seven Mile Canyon is now blocked. On one side of the watercourse, we found a wooden-rail fence that resembled a long hitching rail for horses. With the lonely fence standing at the base of a small escarpment, its original purpose was no longer obvious to me. In this ancient place, the rail fence became a mysterious, yet recent archeological feature. In October 2008, the area appeared wracked by drought. We found no flowing or standing water at all. The only surface moisture was in the muddy area at our entrance to the canyon. In the upper reaches of the arroyo, only thorns and tumbleweeds grew. Around the area, large cottonwood trees had died, while others looked stressed, dying-back almost before our eyes. 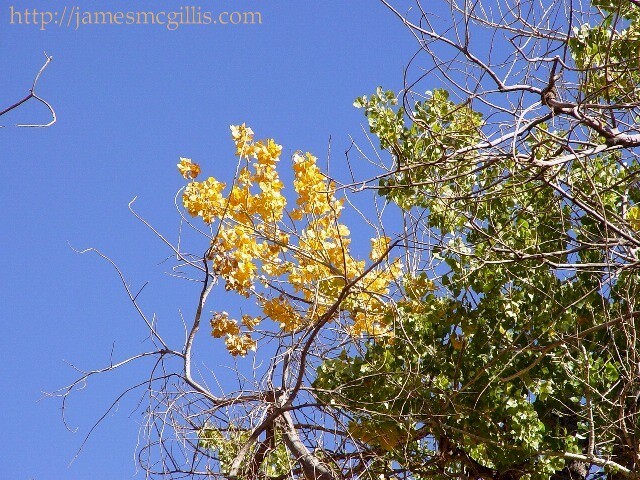 Although the drought around Moab continued since 2008, that one section of cottonwood trees and brush has thrived. The 2012 Google Earth photo of that place shows thick brush and mature trees. That cottonwood stand is the place where upstream thunderstorms go to die. When flash-floods in the stream-bed are large enough to bring water to the thicket, much of it is absorbed in the alluvium. If you zoom-out on Google Maps, our hiking spot is the largest green space for miles around. In ancient days that was true, as well. Prior to the Great Disappearance, we know from tree-ring data that the Colorado Plateau enjoyed a wetter environment. Over millennia, this one patch of greenery could have housed and fed people from many cultures. A mix of ancient and newer styles of rock art in Seven Mile Canyon bears out this thesis. Upstream from the green space, a small side canyon juts away from the arroyo. Next, we visited that dry grotto. In the rainy season, or during a thunderstorm, water pours over the edge of the mesa above, creating a Garden of Eden in the protected alcove below. When we were there, the pool at the bottom was dry and only one stressed out plant of any size was alive in the immediate area. Imagine that space in ancient times. Was it a bathing spot for early residents and visitors? With the profusion of the ancient rock art on the walls of the grotto, I could see that it was once a well-populated place. That day, we spent our time looking, listening and writing, all in the lower reaches of Seven Mile Canyon. At one point, Craig Childs asked us take off our shoes and walk barefoot in the bottom of the sandy wash. “Just feel the Earth beneath your feet”, he said. My field notes from that day read as follows. “As I walk up canyon, I feel hard sand beneath my bare feet. Rather than enjoying my journey, I think about my destination. Will I know it when I find it, or should I just walk on? Now I look up from my writing place and realize that it is here, in this canyon, among these shimmering cottonwood trees that I do belong”. Soon it will be time for me to look again upon Seven Mile Canyon. I plan to do so in May 2013. If you go, be prepared to spend three or four hours in the canyon. Even if you hike no farther up canyon than we did in 2008, your encounter with the Spirit of the Ancients will be well worth the effort.